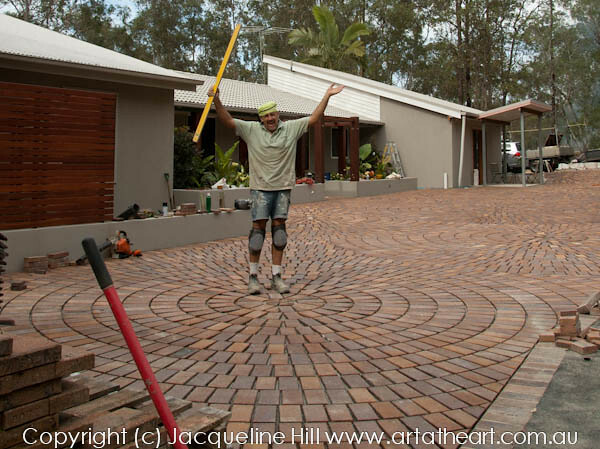 It was quite a job… thousands of pavers, all laid onto a concrete base so trucks and cars can drive over them at the gallery entrance. Hubby Phil is the master of drainage and he had to get all the levels just right so the water flowed away from the house. The job was so big and took so many weeks that we had to celebrate when every circle was finished – with a victory photo! We designed the patterns together, I laid them out on AutoCAD and that gave us the centres and radius for each circle. The finished paving looks beautiful… and you can see it from the Google Earth satellite! For the full story in pictures see here.